Research that Adira Polite ’18 began at Bowdoin when she was a Mellon Mays fellow finds a troubling trend of racial bias in restorative justice practices for juveniles across the country. Polite's article, "To the Roots and Wounds: The Case for Restorative Justice in the Juvenile Correctional System," was recently published in Harvard University's Mellon Mays Undergraduate Research Journal. Polite shows that the use of restorative justice, a decision left to a judge's discretion, is much more common for cases involving young white offenders than juveniles of color. Restorative justice offers an alternative track for meting out punishment, replacing traditional hearings and jail time with what is known as family group conferencing. In the conference, a facilitator mediates a conversation among the offender(s), victim(s), affected community member(s), and law enforcement. The group is tasked with negotiating a resolution. Studies have established that restorative justice leads to higher satisfaction rates for victims and lower rates of recidivism for offenders. "Community-based approaches, such as restorative justice, respond not to the offense itself, but to the offense's roots and resulting wounds," Polite writes. But the benefits of the restorative justice approach are not being shared equally. In Colorado, for example, though praised for its "embrace of alternative corrective practices," only three of the 264 juveniles in 2016 recommended for restorative justice were black. At the same time, black youth accounted for twenty percent of the state's juvenile detention population. Polite says that those "harboring social capital"—that is, those with strong social and community networks—have a significant advantage when it comes to being recommended for restorative justice. "A young offender’s community members may refer them to a court official or restorative justice provider. More often, offenders are referred by law enforcement, prosecutors, probation officers, or prison staff," she adds. After reviewing the referrals, a judge will make a final decision. Though some recent judicial research has explored the racial imbalance Polite highlights in her work, the issue "is largely absent within contemporary restorative justice discourse," she writes. "The inattention to this disparity contradicts the seemingly progressive objectives of the practice's leading proponents." In her paper, Polite argues for a standardization of restorative justice practices across US courts to not only reduce racial bias and improve outcomes for victims and offenders, but also to save money. "By diverting juveniles away from lengthy court proceedings and incarceration and toward family-group conferencing, states will reap substantial savings," she writes. 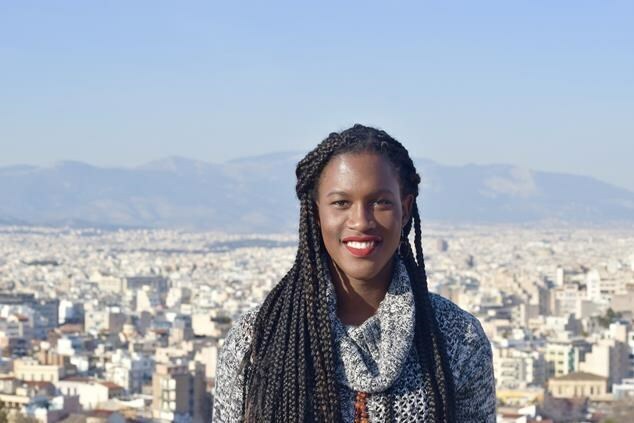 Polite, who was an Africana studies major at Bowdoin, is now working as a capital habeas paralegal for the Federal Defender Program in Atlanta, Georgia, where she assists attorneys in the representation of indigent, death-sentenced clients. "I've always had an obnoxious fixation on justice," she said. "My mother would definitely say that my childhood catchphrase was, 'that’s not fair.'" Both her college research and current job were inspired by a story she heard as a middle schooler in a Georgetown University summer law program, when she listened to testimony from a man convicted for murder when he was seventeen. He was released after spending most of his life in jail, and went on to start an organization to help other former inmates transition to life after prison. "Unlike most offenders, he was given the opportunity to prove that he could and would change. And he did," Polite said. "His story permanently altered my perception of crime and criminals." Text and photo courtesy of Rebecca Goldfine.